• Invest in Programs and Services to End the Epidemic. 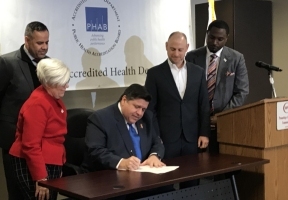 Investments will include prevention measures the Rauner administration had discontinued, including funding for increased HIV testing, PrEP, the African American HIV/AIDS Response Act and other public health initiatives. Additionally, people living with HIV along with their healthcare providers will be invested and supported in achieving undetectable viral loads. • Monitor Viral Load Metrics. 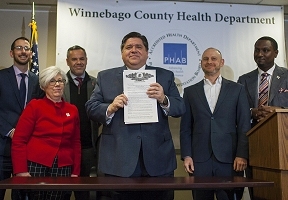 The Department of Public Health and the Department of Healthcare and Family Services, in conjunction with the contracted Medicaid Managed Care Organizations (MMCOs), shall, within 90 days of the effective date of this Executive Order, deliver a report to the Governor containing a plan for the MMCOs to share data with the State in accordance with all laws and regulations governing health privacy, including a viral load metric, so that the State can monitor progress to ensure Illinoisans living with HIV have access to the healthcare they need to keep their viral loads at zero.